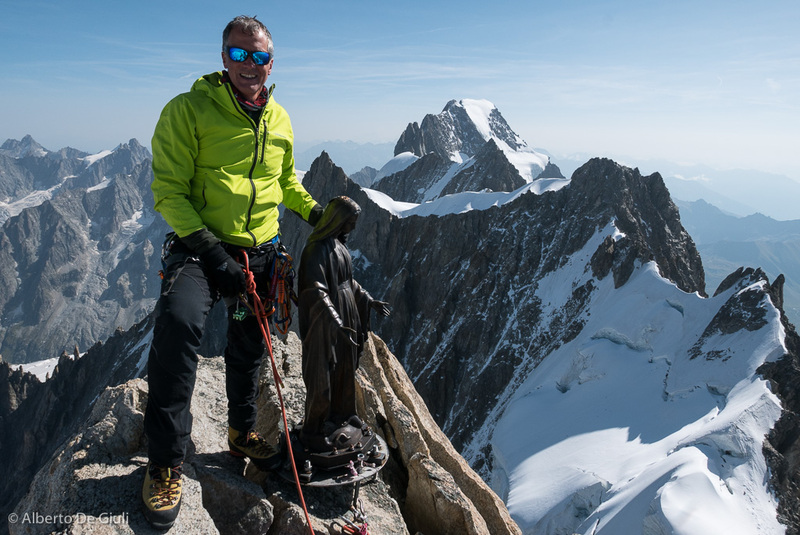 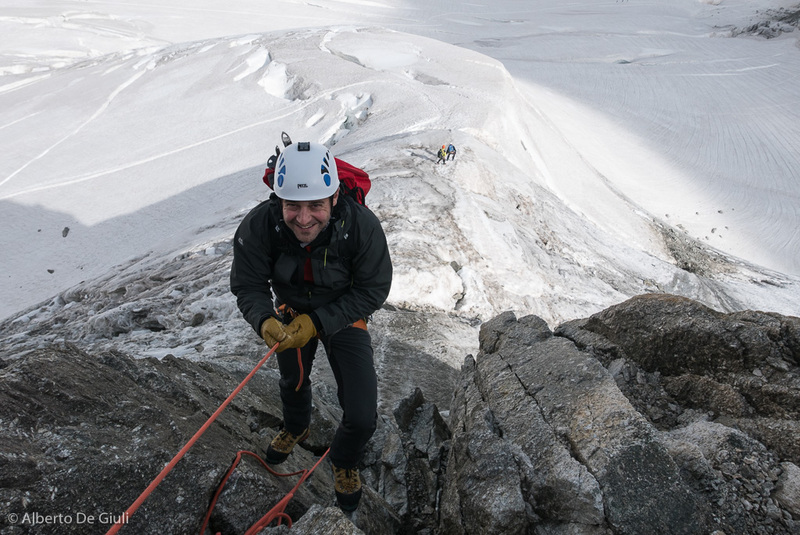 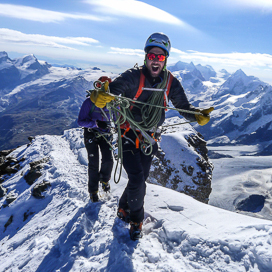 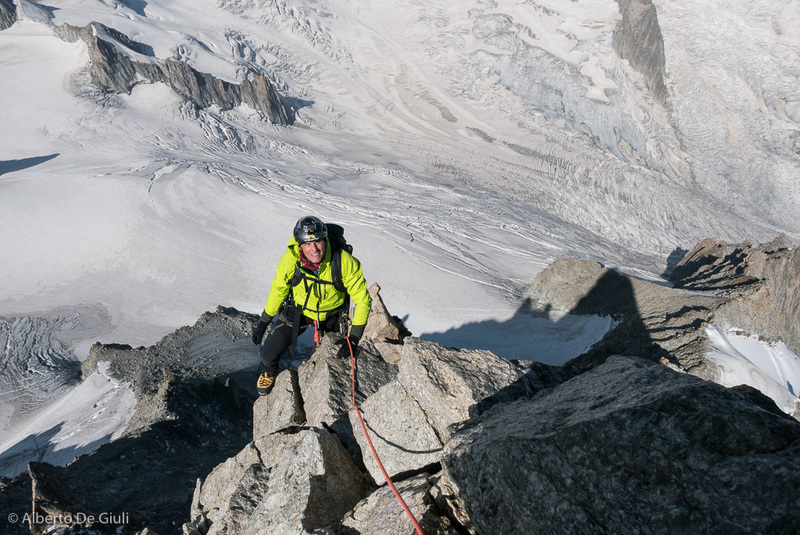 After the Matterhorn week I spent with Helen I spent more time in Chamonix for some classic summer alpinism courses. 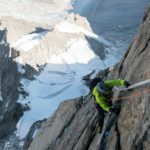 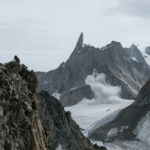 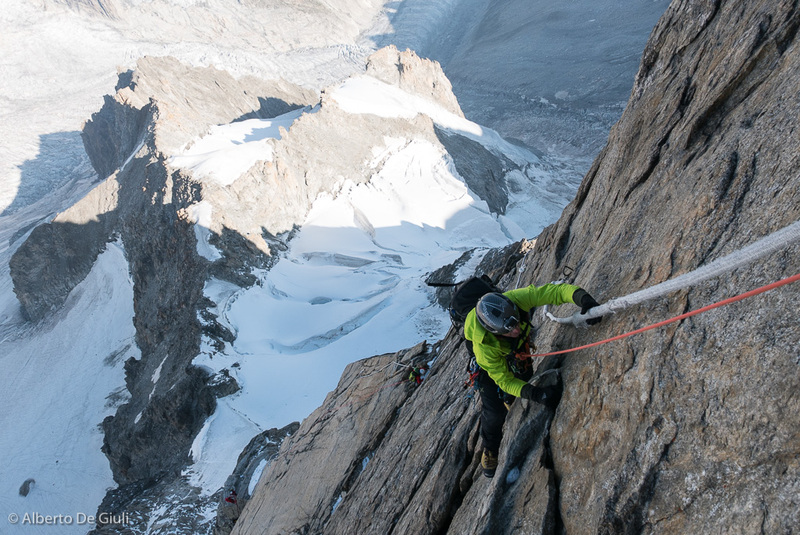 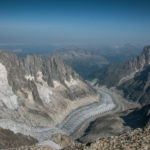 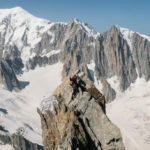 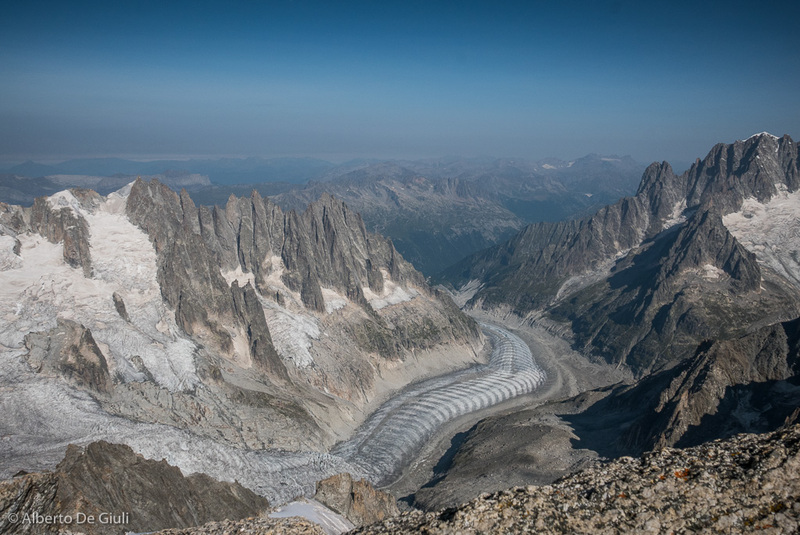 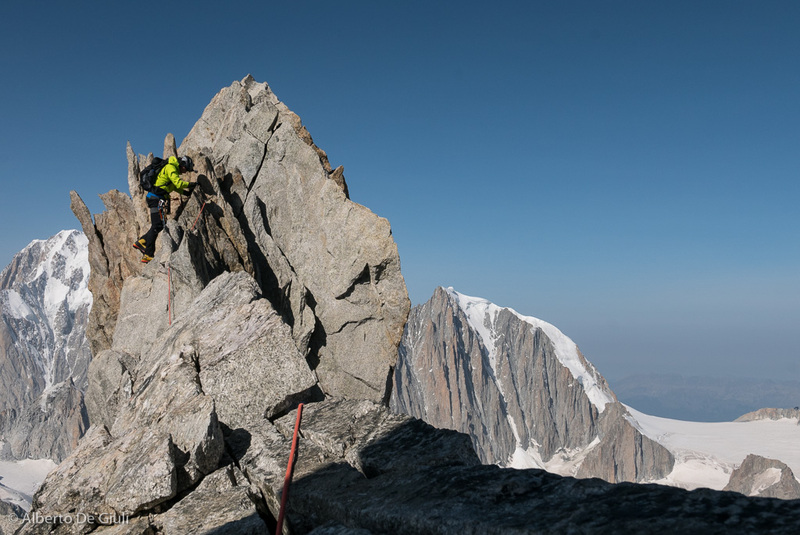 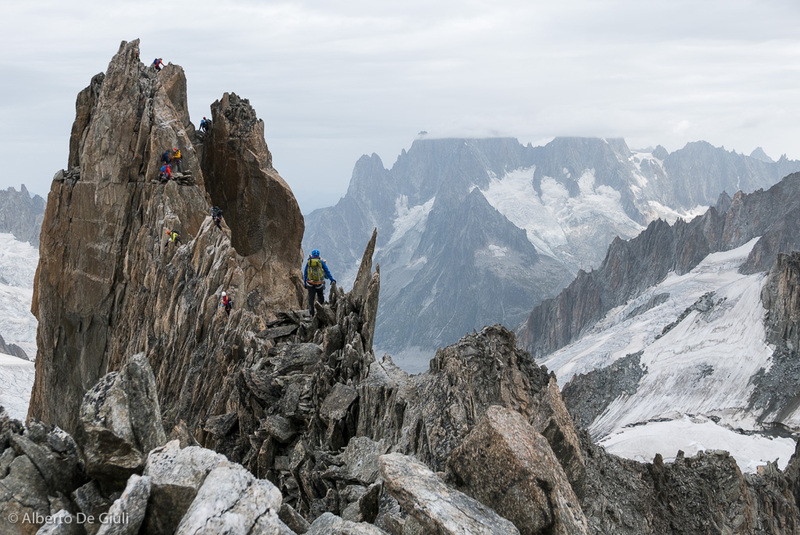 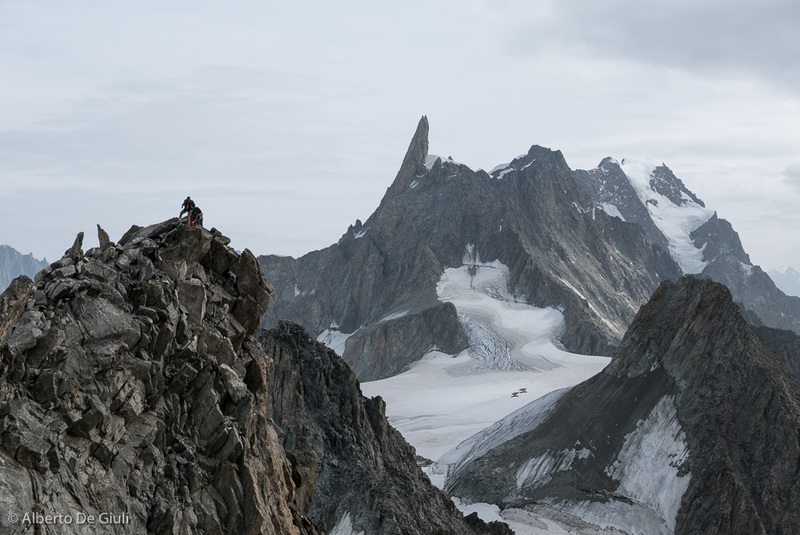 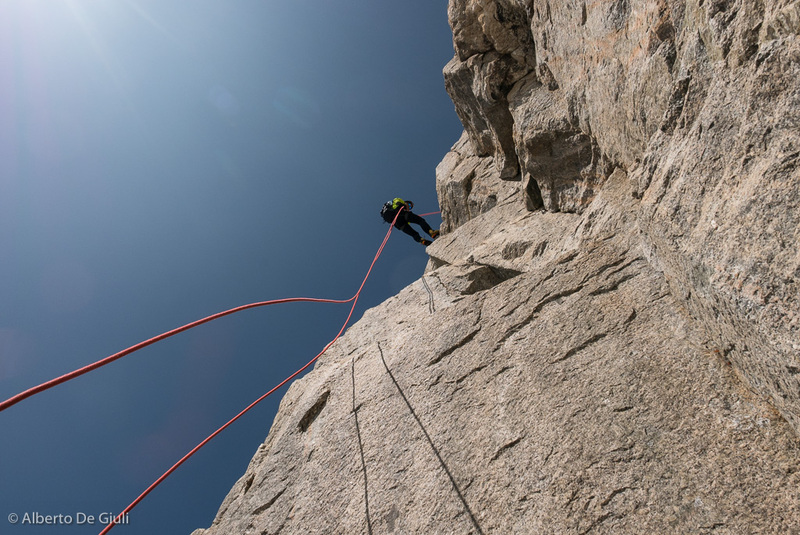 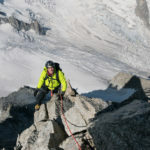 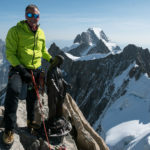 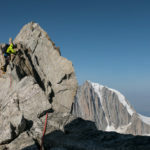 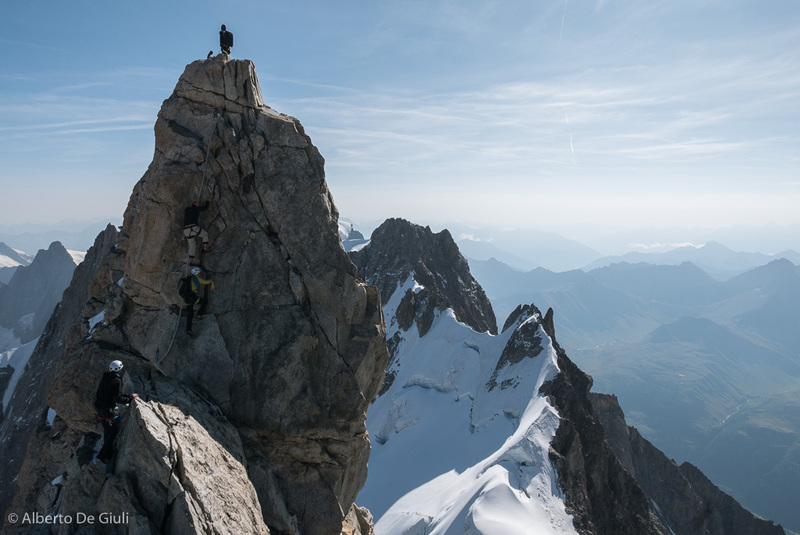 The good weather and heat did not give up, and it was very interesting to me to go back and climb again the traverse of the Aiguille d’Entreves few days after, and see the rapid change on the glacier conditions. 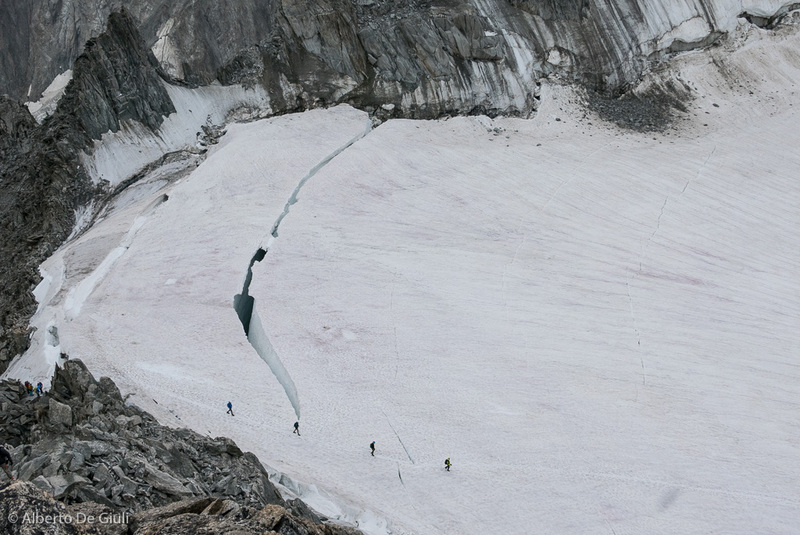 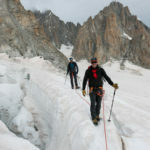 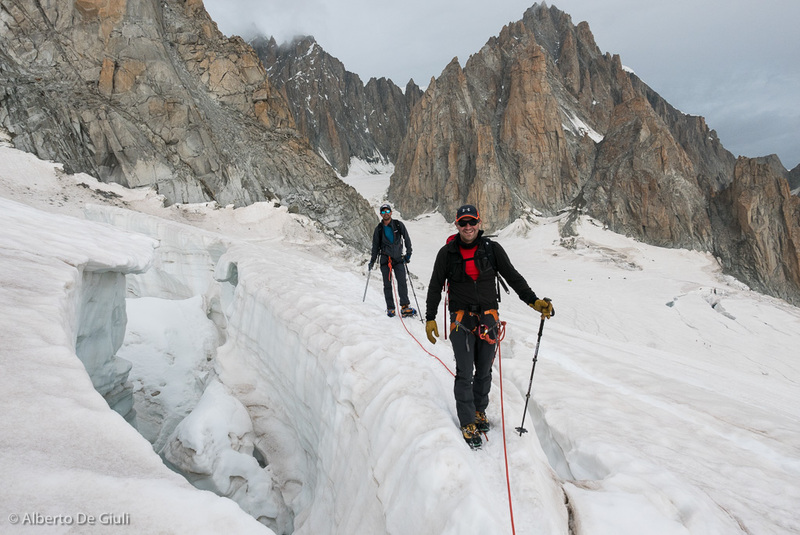 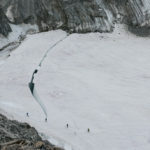 As you can see in the gallery, the normal route to the Tour Ronde was out order as the bergschrund was now fully open, the way out from the Aiguille d’Entreves required a 25-meter rappel on the north side to cross the bergschrund, and still some care on crossing few more crevasses. 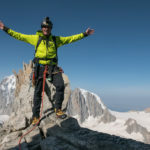 Andy looking happy – was he really happy? 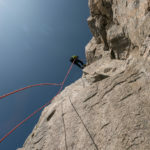 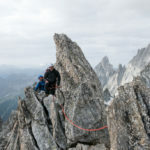 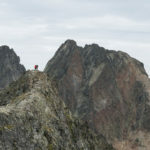 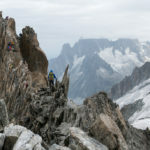 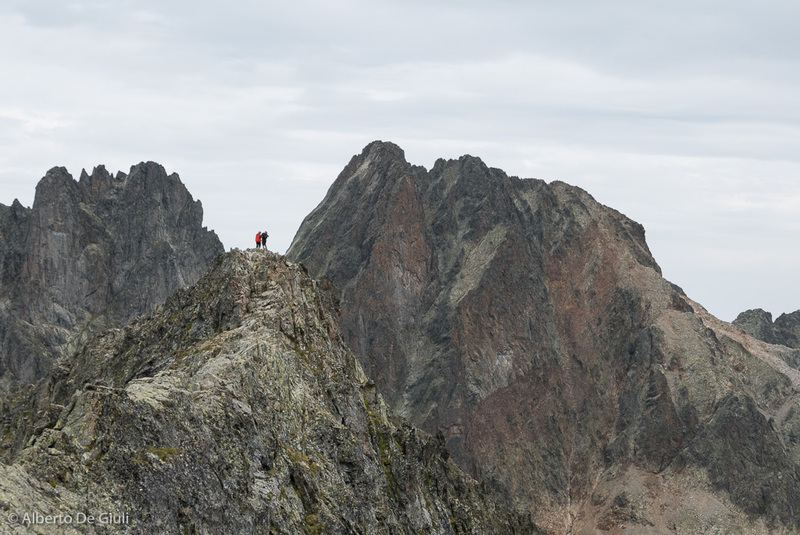 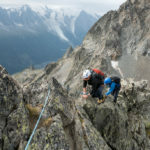 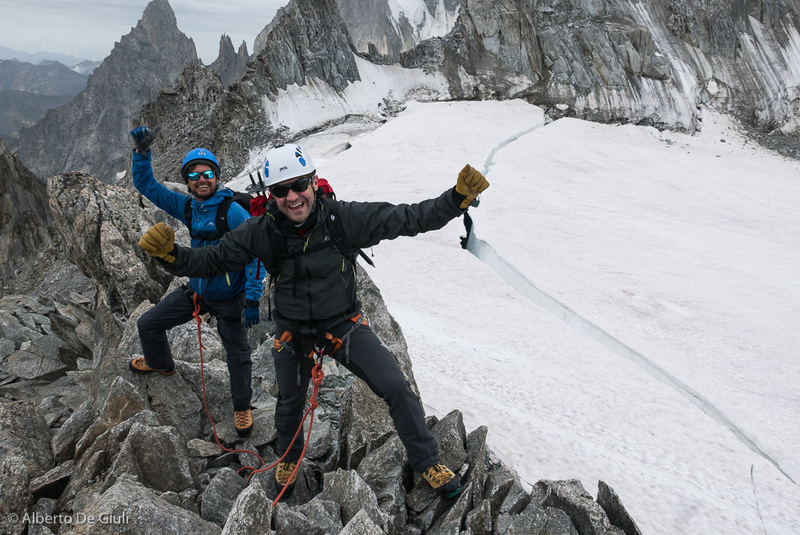 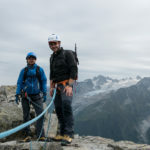 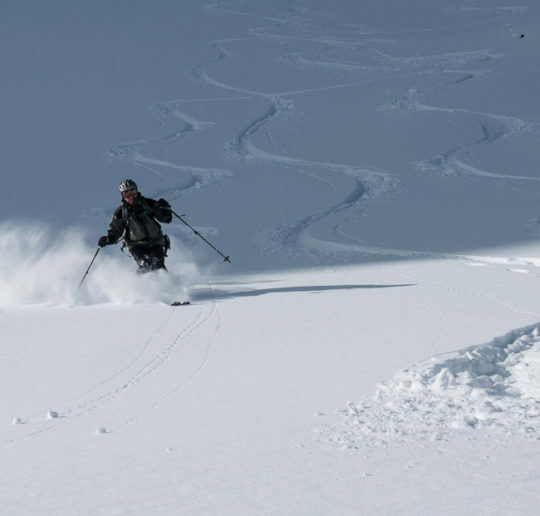 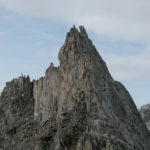 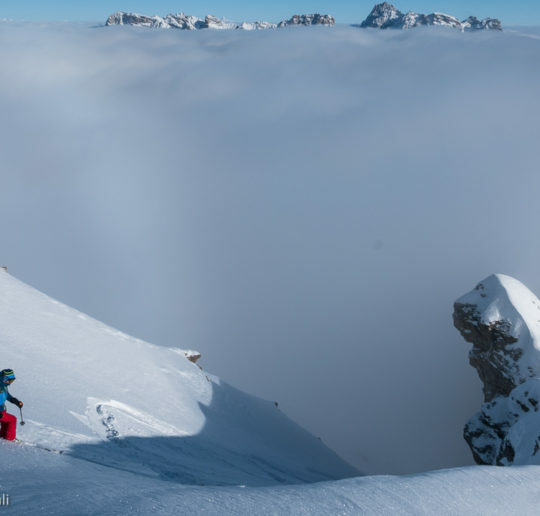 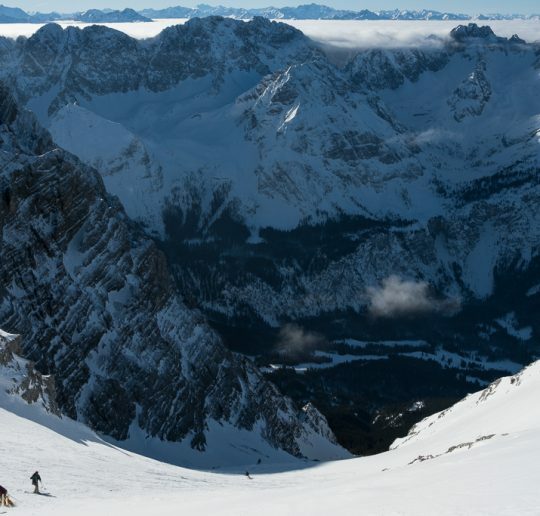 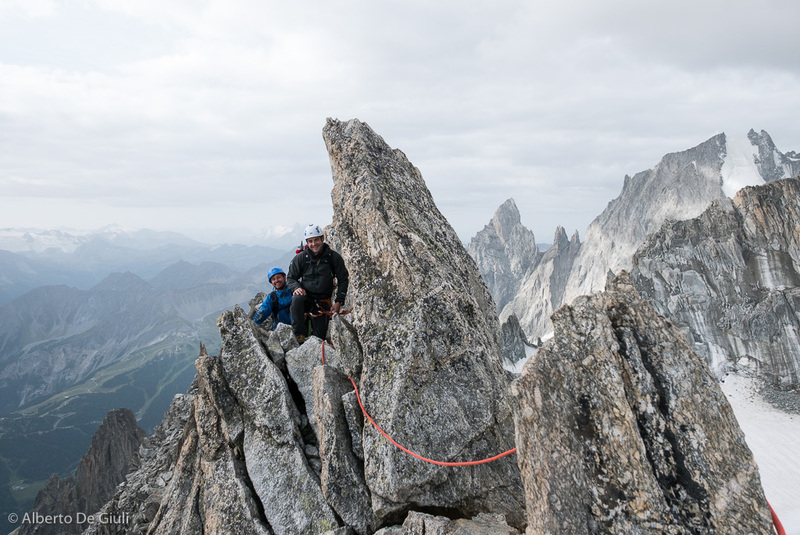 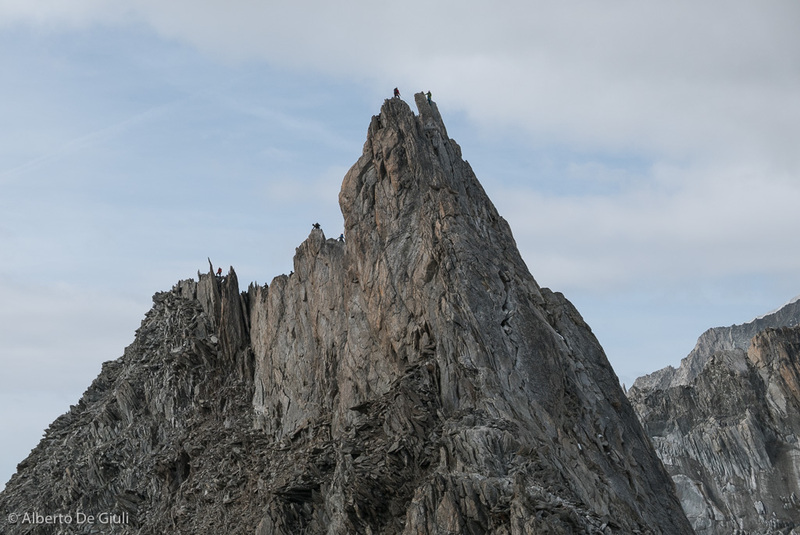 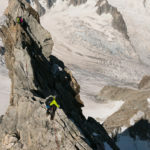 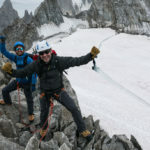 :-) – while traversing the Aiguille d’Entreves. 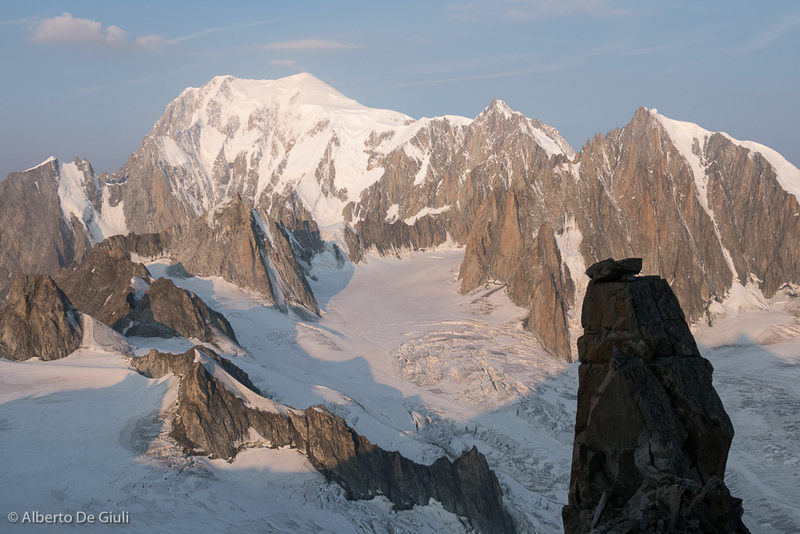 Mont Blanc massif. 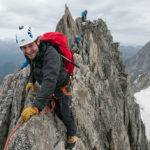 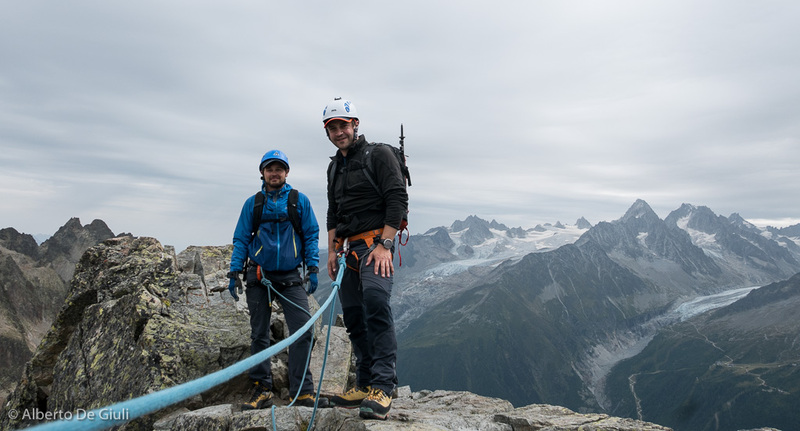 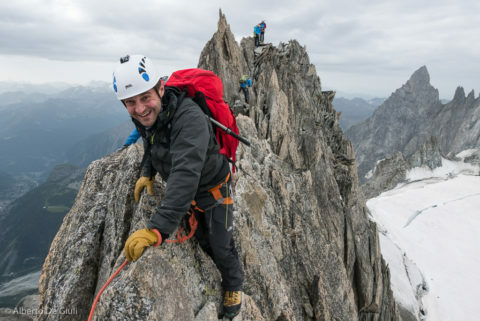 On a pretty gloomy day I went back to the Aiguilles Rouges to traverse the Aiguille Crochues with Ryan and Andy, and again I climbed Dent du Geant on a spectacular day. 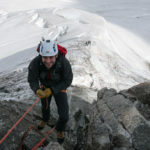 Finally I got to the top of this very popular 4000 meter peak with a warm sun and no wind! 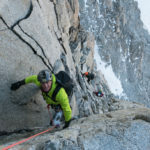 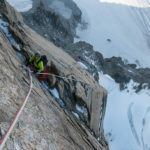 I would like to point out that the descent from the Giant Tooth is now perfectly equipped with bolted anchors with chains (a second rap line, bolted as well, goes down parallel, climber’s left) so you can rappel down with a a single 50 meter rope, 6 rappels and you’ll be down at the Salle a Manger. 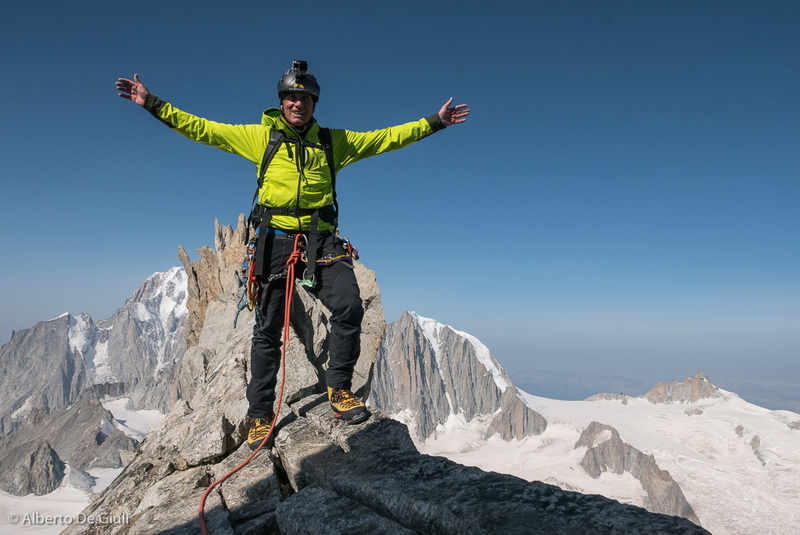 Before watching his video footage about climbing Dent du Geant, here his words describing his personal experience. 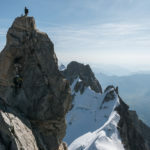 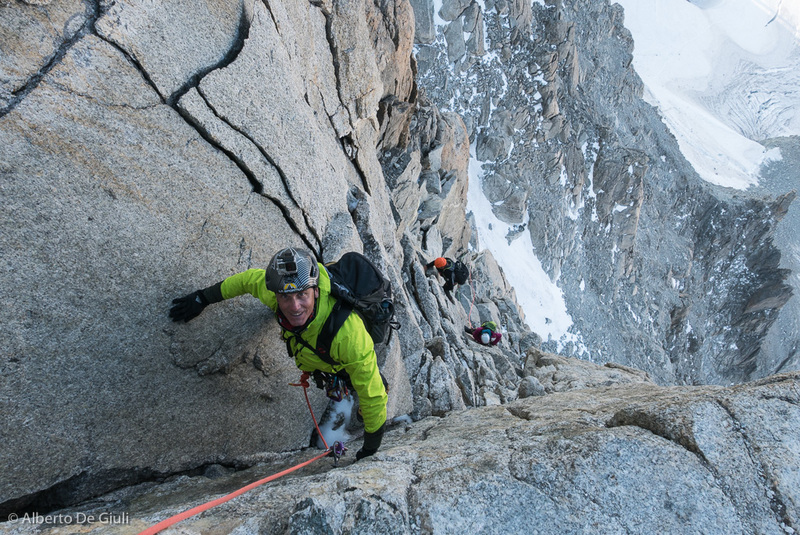 Traverse of Aiguille d’Entreves. 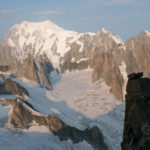 Mont Blanc massif. 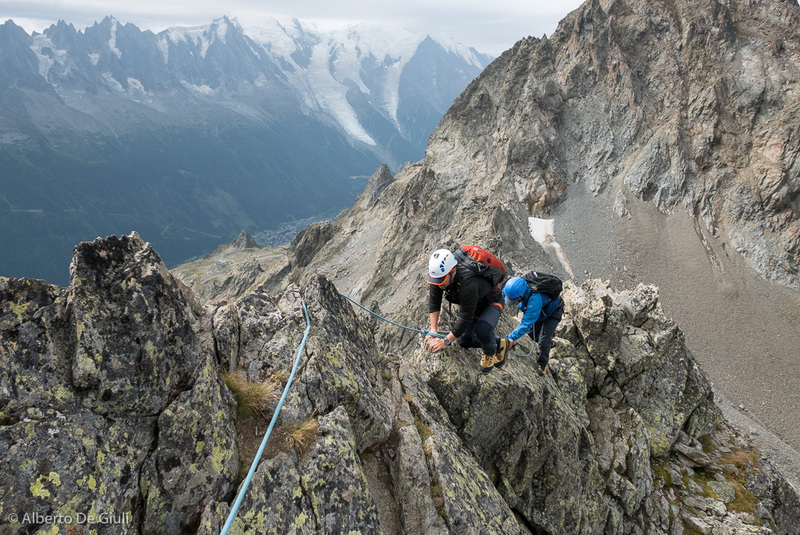 Aiguille Crochues traverse, Aiguilles Rouges, Chamonix. 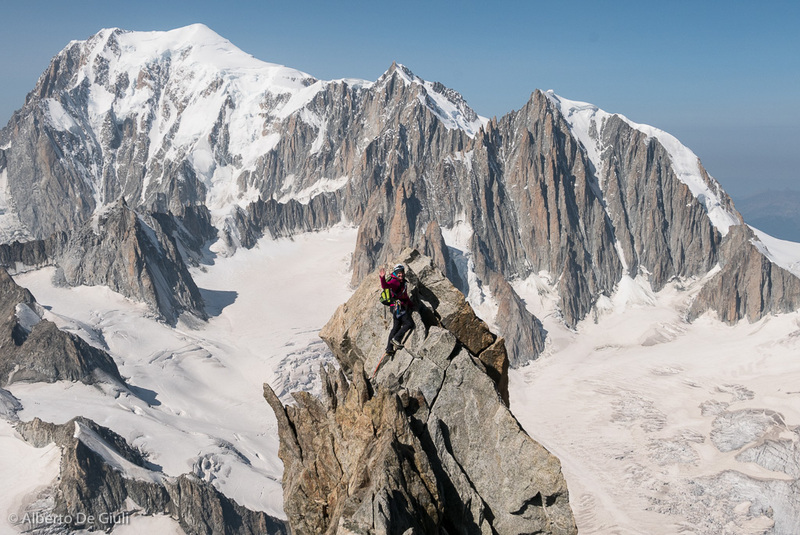 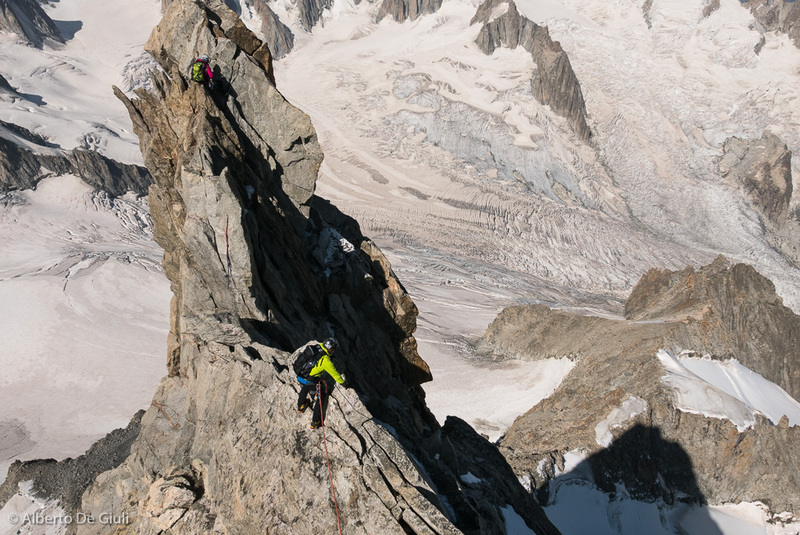 Climbing the Dent du Geant, Mont Blanc Massif. 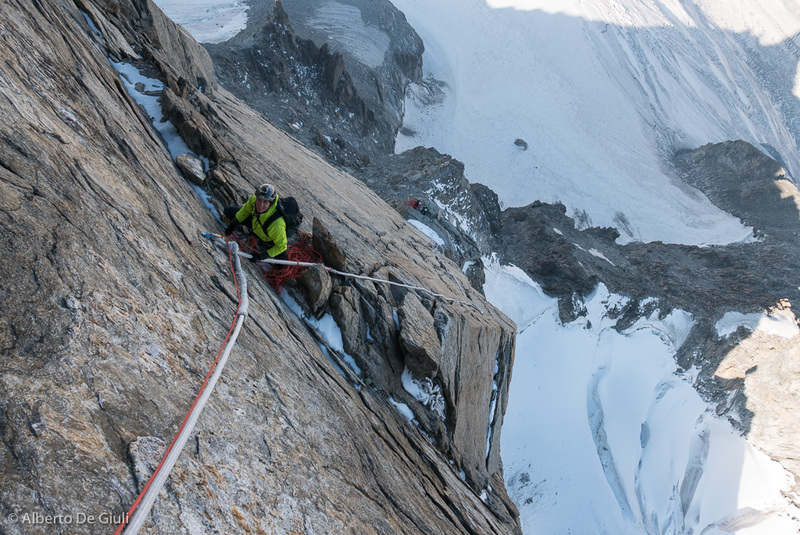 Climbing the Dent du Geant, Mont Blanc Massif.Climbing the Dent du Geant, Mont Blanc Massif.